A DERELICT house in the Cliftonville area is being used by young people to take part in anti-social behaviour – leaving an elderly pensioner who lives beside it unable to sleep at night. The house in Manor Close has been lying derelict since May 2016 but has seen an increase in recent months of anti-social issues, including drugs, alcohol and vandalism. Local community worker, Manus Maguire from Cliftonville Community Regeneration Forum, has called on Choice Housing to secure the property and to move a family in as soon as possible. “This is a very new house, yet it has been lying empty for two and a half years,” he explained. “A family was put into it for a short time around Christmas last year but they left and are in a dispute with Choice. “I’ve never seen a house lie empty for so long. The area is meant to be of very high demand. People are crying out for houses in North Belfast. “At one stage, there were two 14-year-old kids lying outside unconscious and bricks have also been thrown into Cliftonpark Avenue from the property. “The place is a complete mess. Even if they tidied it up and secured it, it would show some sort of interest in it but it has just been abandoned and Choice don’t seem interested one bit. “Choice had agreed to fence off the property to stop young people from gathering in it but have actually done nothing. A local builder has patched it up as best he could. “Choice claim they use a security firm to allegedly monitor the house. They sometimes drive by but never get out of their vehicle. 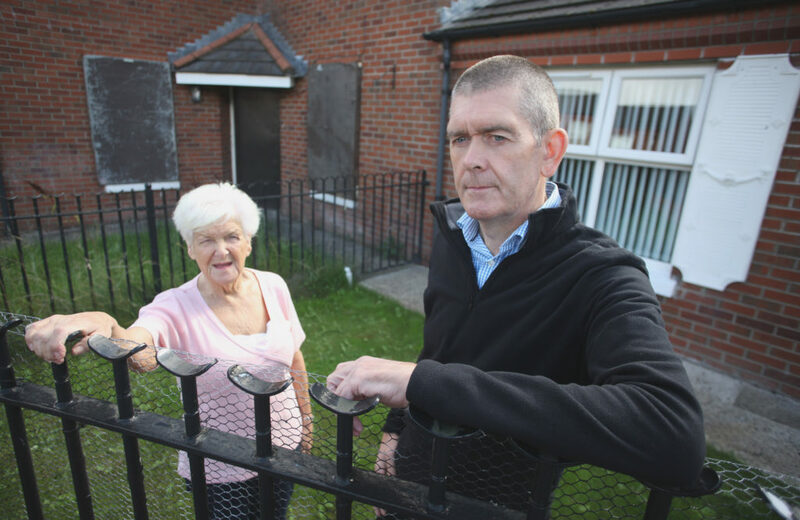 79-year-old pensioner Joan Rocks, who lives beside the property, told the North Belfast News she is not able to sleep at night due to the noise. “There is anti-social behaviour every weekend without fail and sometimes during the week also. “I live on my own. It is heartbreaking to see the state the house is in now. I have been living here for 17 years and have never seen the like of it in my life. A spokesperson for Choice Housing said: “Choice is aware of the reported incidents of anti-social behaviour in the Manor Close area. We take the security concerns of our tenants very seriously and are in the process of erecting a fence to secure the property. “Choice is consistent in its management of anti-social behavior and has appointed INSEC Security to provide 24-hour assistance to tenants whenever problems are encountered. “Choice also monitors anti-social behavior in the area through nightly patrols and will continue to take appropriate and firm action when necessary to ensure tenant safety. Local residents have been provided with contact details to request additional assistance if required.